BMW has released full details of the smallest ever model to emerge from its high-performance M GmbH division. 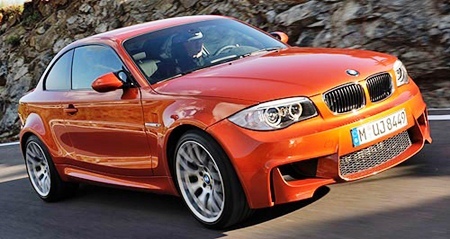 This is the new 1 Series M Coupe. To make this version suitable as an “M” car, the 3.0 liter twin-turbocharged direct-injection ‘N54’ straight six engine already used in a Z4 model, which is the first time a standard production powerplant has been seen in the bona fide M collection. Producing 250 kW at 5900 rpm and 450 Nm of torque from 1500-4500 rpm (with an over boost function increasing torque to 500 Nm for short bursts under full acceleration), the engine drives the rear wheels through a newly developed six speed manual gearbox resulting in a 0-100 km/h in a claimed 4.9 seconds. This is just one tenth of a second slower than the M3 sedan, but it is still fugly. BMW’s EfficientDynamics program, where accessories are governed by a ‘needs’ at the time basis, have taken the consumption below 10 L/100 km for the first time, with the 1 M Coupe’s official combined fuel consumption rated at 9.6 L/100 km. CO2 emissions come in 224 g/km, but quite frankly, I have yet to meet anyone who cares about carbon foot prints – or even understands it. The M version retains the 1 Series’ double-pivot spring-strut front and five-link rear suspension design, although the aluminium content has increased significantly, unique axle supports are included, the electronic differential lock is now M-specific, the electronic stability control includes an intervention threshold-raising M Dynamic Mode (MDM), the rack-and-pinion steering is fitted with the Servotronic hydraulic system, and the brakes are upgraded to M3 level, with inner-vented and perforated M-specific discs with a 360/350mm front/rear diameter, each with a single piston floating calliper. The wheel and tyre combinations are now 19 inch M light alloy rims in a Y-spoke design, with 245/35 tyres at the front and 265/35at the rear. The usual alphabet of electronic whizz-bangery with ABS brakes, an anti-slip control function (ASC), dynamic brake control (DBC), cornering brake control (CBC), a so-called ‘drive-off assistant’, and anti-fade and dry brake functions designed to further improve stopping performance. So, BMW have managed to produce a hot rod from its parts bin, which I am sure drives very well. It is a shame that it is still fugly. Very fugly. Previous articleKeep your roof on!